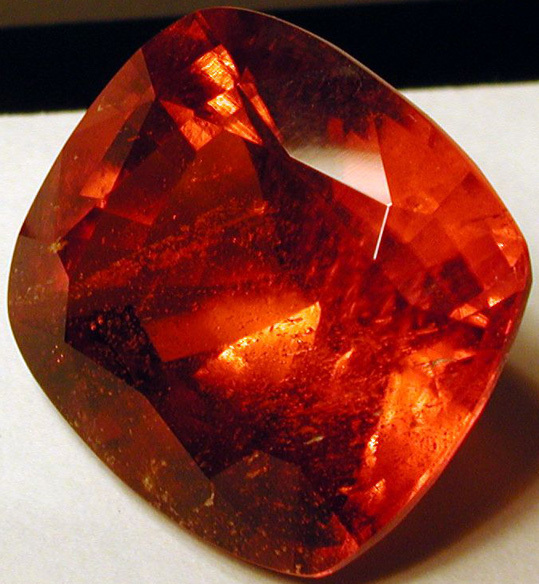 Clinohumite is a neosilicate mineral noted for its dazzling fiery orange color. It was named after the celebrated gem connoisseur Sir Abraham Hume (1749-1838), and also because of its monoclinic crystal structure. Clinohumite belongs to the Humite group of minerals and is an uncommon magnesium silicate with the chemical formula (Mg,Fe2+)9(SiO4)4(F,OH)2. The crystals of Clinohumite found in its natural form are typically extremely small and not clear, however some gem quality material has been discovered and faceted into gemstones - such as the ones in the images. The crystals of Clinohumite are characterized by fluid inclusion that typically gives the crystals a translucent to opaque appearance. The crystals of Clinohumite are considered uncommon members of the Humite group and are composed of magnesium silicate. The IMA considers the crystals of Clinohumite to be grandfathered. The silicon in the crystals of Clinohumite classifies it as a silicate mineral. The crystals of Clinohumite display monoclinic prismatic properties and in their natural form are found in crystalline masses of size 2 cm. The crystals of Clinohumite are complex by nature and display properties of twinning which is simple and often lamellar. The Clinohumite crystals also display uneven and irregular fracturing. The cleavages on the crystals are also quite poor making the Clinohumite crystals quite brittle. The Moh’s hardness for the crystals of Clinohumite is between 5.8 and 6.0. The density of the Clinohumite crystals varies between 3.1 g/cm3 and 3.3 g/cm3. Clinohumite has a refractive index of between 1.631 and 1.668. Clinohumite was first discovered in 1876 in the limestone formations in Naples, Italy - in limestone that had been ejected from Mount Vesuvius. It was first described by E.S. Dana in 1892. Clinohumite crystals are often indistinguishable from the surrounding rock formation due to their extremely small size and inclusion. The first discovery of the Clinohumite crystals led to more exploration in the Mount Vesuvius area in Naples, Italy. But the largest deposit of the crystals of Clinohumite was found near Lake Baikal in the Pamir Mountains which are now in Tajikistan. Subsequently gem quality Clinohumite crystals were found in Tanzania, but later more mining and exploration in the Pamir Mountains led to the discovery of more deposits of Clinohumite crystals. Non-gem quality clinohumite is found in numerous locations in the world, including: Antarctica; Mount Bischoff, Waratah, Tasmania; the Saualpe Mountains of Carinthia, the Koralpe mountains of Styria, and the Vals, Virgen, and Ziller valleys of the Tyrol, Austria; the Jacupiranga mine of Cajati, Sao Paulo State, Southeast Region, Brazil; the Pirin Mountains of Bulgaria; Bancroft, Ontario, Notre Dame du Laus, Wakefield, and Villedieu Township, Quebec, Canada; Southern and Western Finland; Bavaria and Saxony, Germany; eastern Greenland; Ambasamudram in Tamil Nadu, India; Honshu, Japan; Suan, North Korea; Nordland, Norway; KwaZulu-Natal and Northern Cape Province, South Africa; Andalusia, Spain; Värmland and Västmanland, Sweden; Isle of Skye, Scotland; California, Colorado, Massachusetts, New Jersey, New Mexico, New York, Oklahoma, Utah, and Washington, USA. The Pamir Mountains have produced many gem quality Clinohumite crystals which have been as large as 21 carats and also clear to the eye. The stunning and rare reddish orange coloring of the Clinohumite gemstones, together with their rarity, make them one of the more sought after gemstones among collectors all over the world. 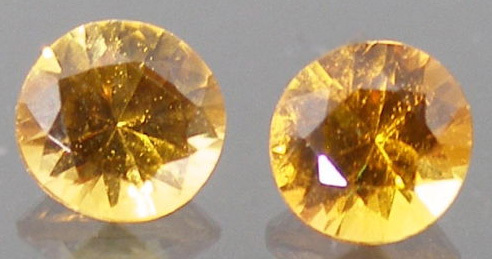 Clinohumite can be seen for sale online and faceted clinohumites can be seen priced at around $40-50 per carat (May 2012) for moderately included stones in the 2-10 carat size range. Stones over 10 carat are uncommon and prices per carat may thus be higher.